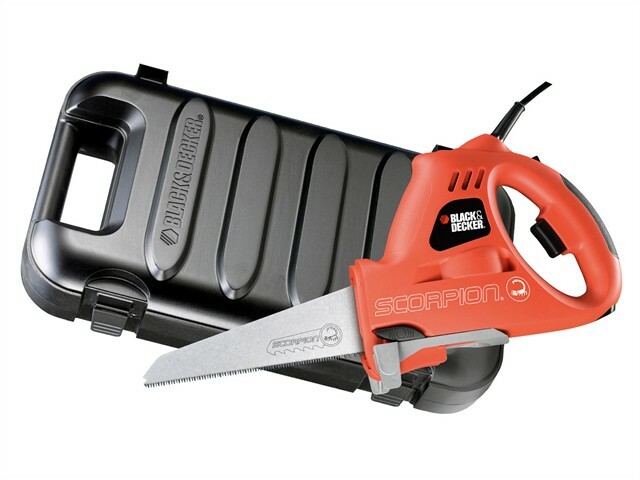 The Black and Decker KS890EK Scorpion Powered Handsaw cuts Time and cuts Effort. It has both powered Handsaw and Jigsaw modes which adds to its versatility and speed of use. The saw has a tool-free push button blade change system, safety lock-off switching which prevents unintentional starting and fingertip variable speed control for safe and accurate cutting. Suitable for use in straight line or curved cuts with choice of cutting mode and is capable of cutting wood, metal and plastic. Strokes at No Load: 0 - 5,500/min. Blade Sizes: 239, 153, 134mm.